Yay! I’m so excited for Spring! Not that we’ve had a harsh winter this year, but I am so tired of dark colors. I think spring fever hit me when I saw the Starbucks colorful cups. I was craving color! For me, Spring equals gardening. I just can’t wait to start planting all the things! So the first sign of spring for me is plant fever! I have a silver bowl just like hers that I had snatched out of a box of stuff my mother-in-law was getting rid of. After buying a couple of succulents and raiding some others, I was ready to get to work. Since succulents need to keep their feet dry I knew I was going to need some good drainage. I didn’t have any pebbles so I used mulch as a base layer. 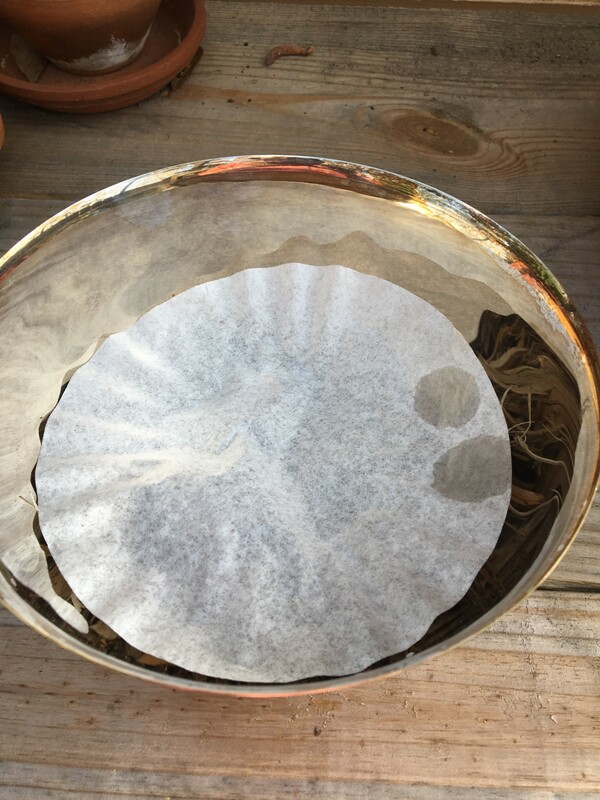 Then I laid a coffee filter on top to keep the dirt from settling into the soil. After adding soil, I placed my little plants. After digging around in my craft stash, I found some little pebbles so I topped the whole thing off with them. I love it! Now it sits on my coffee table and makes me smile when I see it. As you can see, it’s not a hard projects! 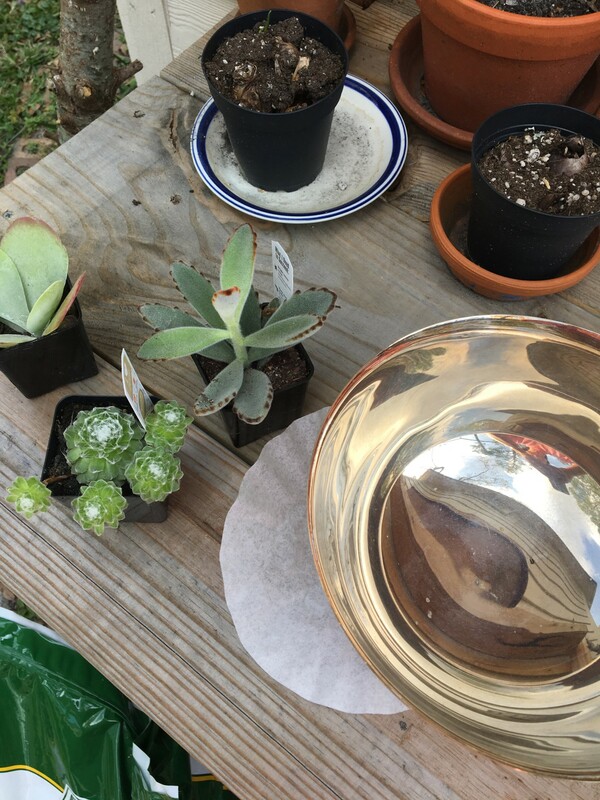 These silver bowls are pretty easy to find at thrift shops! Or you could use a silver urn too. I’ve seen that done on blogs as well. 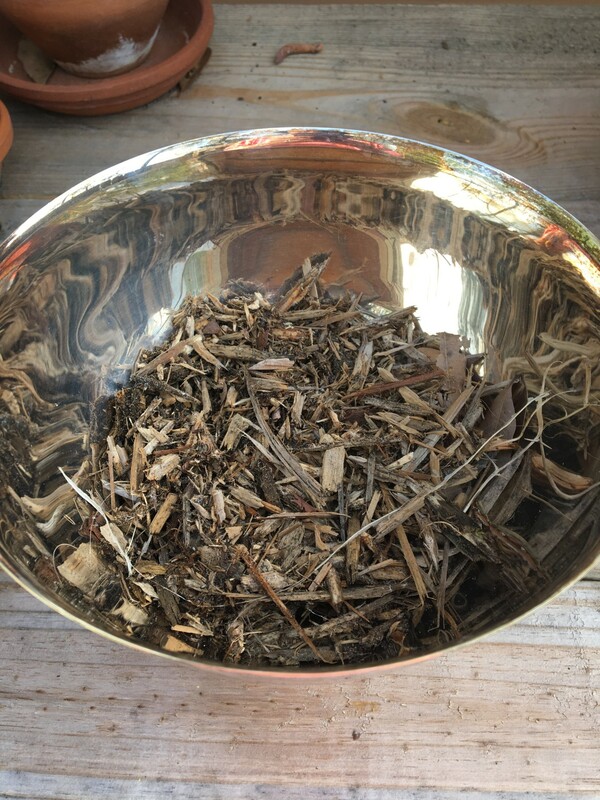 I’m off to get more dirt under my nails…In case you missed it, we were busy this winter too working on little projects around the the house which included a potting bench. All the more reason to garden! 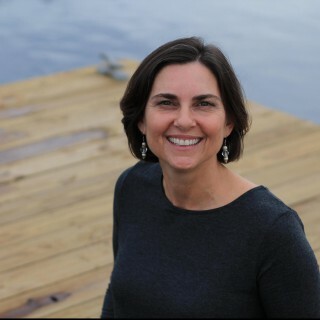 I’m participating in a blog hop so be sure you go see what other signs of Spring Carrie and Leslie are sharing! This is fabulous, Sheila! Thanks for sharing. 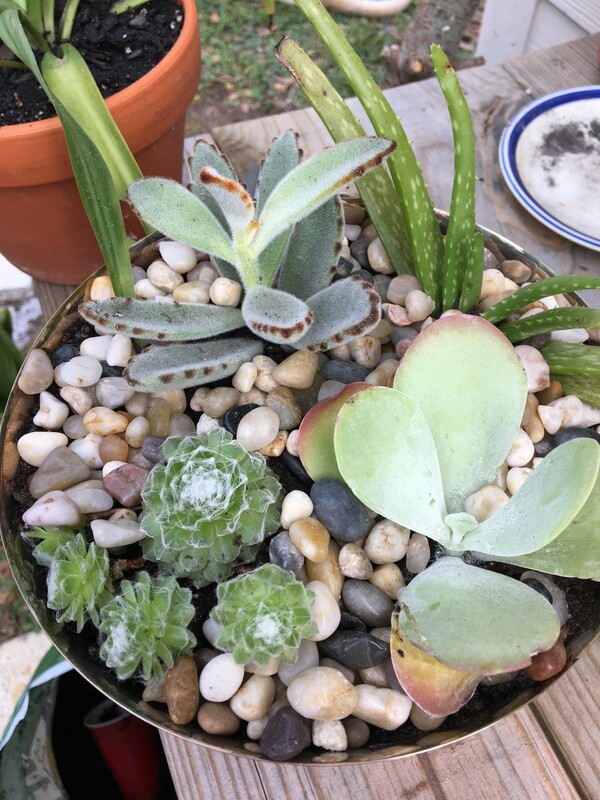 My daughter loves succulents and this encouraged me that it’s not that hard to get started. It’s not hard at all! My mom has always been a fan of succulents. I have just recently gotten started with them. 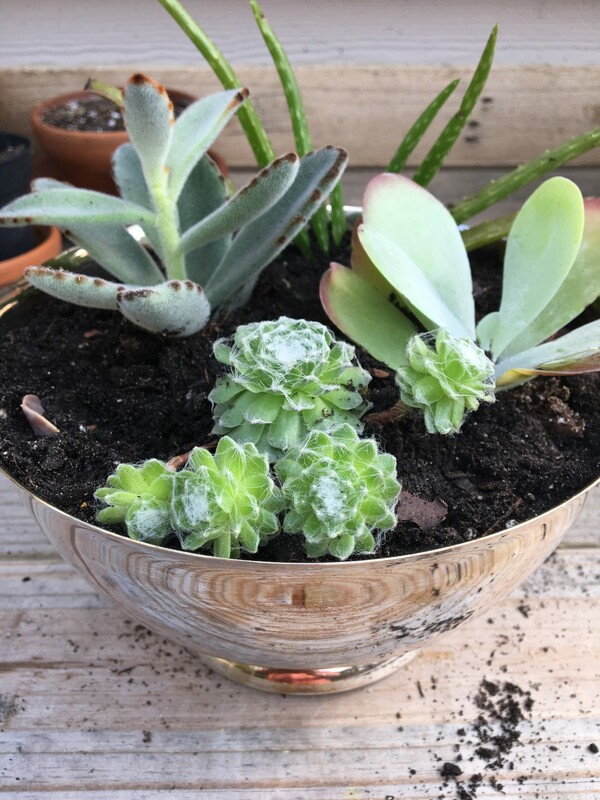 They are a better plant choice for me because if I forget to water they are quite forgiving! What a great idea – it turned out so pretty! Not many signs of spring around here yet – but I know it’s coming…right? I was up in Kansas City this weekend and the trees were still stripped bare! We are in full growing season here! Hang in there! It will come! Seeing succulents everywhere. Thinking they might work around the pool once we get to that place in the construction. Love your little arrangement. Definitely think cacti and succulents would work in your arid environment!